House Speaker Nancy Pelosi says the CIA "misled" her about waterboarding. What difference does it make, in the grand scheme of things, whether Pelosi is telling the truth? Maybe the CIA did; maybe the CIA did not. So what? Well, it makes a great deal of difference -- and not only because if true, the CIA didn't just "mislead" Pelosi but also committed a crime. People like Pelosi, who once supported waterboarding -- just like the folks who once supported the war -- now attempt to rewrite history. The country turned against former President George W. Bush and Republicans because of the war in Iraq. Yes, many Americans reversed their previous support of the war because of its unexpectedly high human and monetary costs. Yes, many turned against the war because, in its early stages, Iraq seemed on the verge of civil war. To many, the toppling of dictator Saddam Hussein backfired -- and made America less, not more, safe. But what turned growing unease over the war into outright disdain for Bush? As to the case for war -- the assumption that Saddam possessed weapons of mass destruction -- many Americans feel flat-out lied to. This brings us to waterboarding. Like Guantanamo Bay and Abu Ghraib, waterboarding serves as a metaphor for the former President's alleged deceitfulness and villainy. Pelosi denounces waterboarding as torture, yet another outrage by the lying, scheming, manipulative Bush administration. Pelosi, at first, said she knew absolutely nothing about the administration's use of this "enhanced interrogation technique." The CIA disputes this. But by her own admission, the agency told her that it was considering using waterboarding. Wasn't that enough for the speaker to have thundered her disapproval? What about a letter of protest to the Bush White House? What about moving to cut off funds to prevent the agency from employing a technique that she purportedly finds so offensive? The CIA pushed back. The agency said that it informed Pelosi, who received briefings, that it not only intended to use waterboarding but, in fact, had used waterboarding. Former CIA Director Porter Goss said that the CIA provided accurate information to Pelosi. Goss further said that the only objection during the briefing was the concern as to whether the CIA was going far enough. Current CIA Director Leon Panetta agreed with Goss. In a memo to CIA employees, Panetta said, "CIA officers briefed truthfully on the interrogation of Abu Zubaydah, describing 'the enhanced techniques that had been employed.'" Panetta also wrote: "Our task is to tell it like it is -- even if that's not what people always want to hear. Keep it up. Our national security depends on it." Before declaring in a news conference that she no longer wants to stress the matter, Pelosi praised the CIA. Pelosi said, "My criticism of the manner in which the Bush Administration did not appropriately inform Congress is separate from my respect for those in the intelligence community who work to keep our country safe." Does her respect extend to former CIA head George Tenet? Tenet served under former Presidents Clinton and Bush. As for believing Saddam Hussein possessed weapons of mass destruction, Tenet described the case as a "slam-dunk." Does she now "respect" that he made that assertion in good faith? It tells us that in the immediate aftermath of 9/11, most Americans -- including the Democratic leadership in Congress -- wanted to prevent another attack. 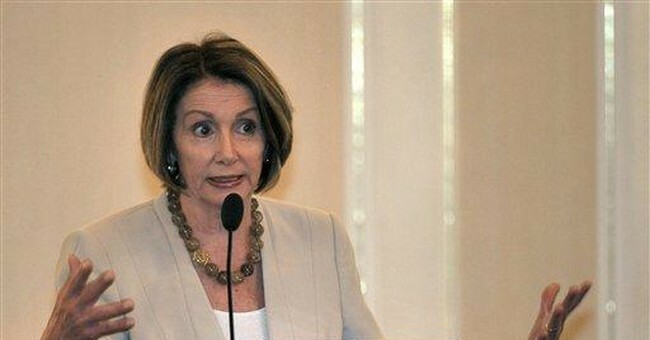 Despite their newfound "outrage" over torture, people like Speaker Nancy Pelosi understood, accepted and even encouraged harsh interrogation techniques to prevent another attack. As to the case for war, all 16 intelligence agencies concluded -- at the highest level of probability -- that Saddam Hussein possessed those stockpiles. Yet people like Sen. Ted Kennedy said things like "week after week after week, we were told lie after lie after lie." And many Americans -- especially those predisposed to believe the worst of the Bush administration -- completely bought it. "Bush lied, people died" became a refrain uttered endlessly by Bush haters. But Bush didn't lie -- and the Democrats know it. Indeed, to extricate herself from Torture-gate, Pelosi now compliments the CIA, the very agency Bush relied on in making the case for war. But public opinion turned against the war. Then waterboarding became "torture." And Bush became not simply a commander in chief who, in good faith, relied on near unanimous but faulty intelligence. He became, as then-Minority Leader Harry Reid said, "a loser" and "a liar."